I’m giving a presentation tonight at the Tulsa .Net Users Group titled The 7 Habits of Highly Effective Developers. Sure, a developer needs to be a good coder. But, in reality that is a very small piece of their job. In this session we’ll discuss some of the other skills and habits that developer should concentrate on in order to be successful. 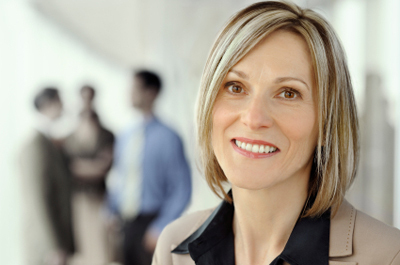 In my career, I have worked for and observed a wide range of managers. Some are great, some are less so. But, as I’ve made the progression into management over the last couple years, I have thought a lot about what makes a good manager in IT. Perhaps these apply to other fields, but IT is the one I have the most exposure to, so that is all I can speak of. This first one deals mainly with how achievements and failures by the team as a whole are looked upon by those outside the team. It is a hard one for many managers. If you and your team do well, a lot of times upper management will praise you. They may be completely unaware of the hard work that your team put in. Be sure to share the credit for the achievement with your team. One of the quickest ways to lose the respect of your team is the accept the credit for what they have done for yourself. But, on the other hand, if something goes wrong with a project, the manager needs to accept the responsibility for the failure for themselves. Upper management never looks well upon a manager who blames problems on their team. And you’ll gain the respect of your team if you accept the responsibility (at least to those outside the team) for yourself. This next one deals with individual achievements or failings of someone on the team. If someone on your team really messes up, never reprimand him or her in front of the other team members, and certainly never in front of people from other teams. I’ve seen this done before and it’s the quickest way to lose my respect. If someone messes up, pull them aside and talk to them privately, where others cannot hear. Discuss what they did wrong, why it was wrong, and what they can do to do better in the future. However, on the flip side, if someone does an outstanding job, praise him in front of the rest of the team. The team needs to know the hard work and achievement are rewarded. They’ll strive for this recognition themselves. Within IT you have managers with strong IT backgrounds, such as those that use to be programmers themselves, and those without this background. In my experience, the best managers are those that have the background and really know their stuff. However, if a topic comes up that the manager is not familiar with, he or she must be willing to admit that they do not. I have know managers that try to pretend they have the depth that they do not. This is another quick way to lose the respect of your team. But, as a manager, you have a team. And part of your responsibility is the hire good people. And, if you hire and pay for good people, you would be foolish not to listen to them when they are speaking from their own expertise. A manager must always be willing to listen to his or her people. There are times that you have to stick to your decisions, but you team must feel like they were at least given a voice. But, as often as not, someone on your team will have a better idea than you do. You must be willing to listen to them and have the humility to admit that they are right. This is a big one, and I’m pretty sure I’m going to devote an entire post on how to hire the right people. As a manager, you are not doing everything yourself. Most of the time you cannot possibly do everything yourself. You must be able to delegate tasks and responsibilities to your team. And they only way you can do this and be successful is if you hire the right people. But, just hiring them isn’t enough. After you have hired them, you must empower them. Be able to delegate responsibilities to them and trust that they are going to do a good job. By default, do not micromanage. I have had people on my team in the past that I have ended up having to micromanage, but they were definitely not the right people and should not have been on the team to begin with. The only way to stay sane in management is to be able to delegate to your team and trust them to do a terrific job. A big part of management is making the hard decisions. These are the decisions where the long term results are unclear and the wrong decision could potentially be disastrous. Collect all of the information you need. Determine if a decision needs to be made. If it needs to be made quickly, trust the input from your team and make the decision. A lot of times problems are made worse because decisions are not made in a timely manor. These managers lack the confidence in their themselves and their team to make the decisions. If the decision ends up being wrong, have the guts to admit your mistake and move on. Management is hard, and it can be very stressful. But if, as a manager, you would follow the basic principles I have outline above I’m confident that you and your team will be successful and you’ll win the respect of your team and your peers. In the previous posts I have discussed the process of software development so that we can get a good handle on what we are estimating. I have discussed the cone of uncertainty so we can know how accurate our estimates should be. And I have talked about four different estimation techniques: Expert Judgement, Count, Function Point Analysis, Story Points, and Decomposition. So, you may ask, which estimation technique is the best? And my answer would be, as in so many things, “it depends”. If you are very early in the project, and have team members with a lot of experience in the environment and good historical knowledge of projects in the domain, Expert Judgement will be a good choice. If the project will have components that are easily identifiable early in the process, then Count is good. If you are doing a pure Agile project and your schedule can be a little more fluid, then Story Points will work for you. If a detailed design has been completed, Decomposition is good. My favorite estimation technique, though, is Function Point Analysis, which can be executed at any stage in the project. But you must have a counter with experience in the technique. The best plan, though, is to become very familiar with all of these techniques. You can then have these tools in your back pocket that can be pulled out and used on any project, depending on the unique nature and needs of the individual project. For more information on the subject, I highly recommend reading the book Software Estimation: Demystifying the Black Art by Steve McConnell. This book does a good job of going into detail on each of these techniques and several more. Thanks for joining me as I worked though this series. This is a topic I’m passionate about. I hope that reviewing these techniques has helped you out in your own projects. 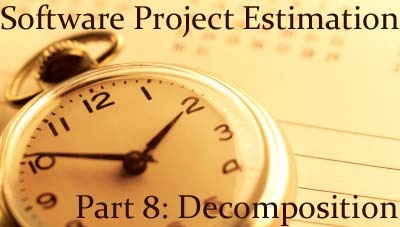 Decomposition is the estimation technique most software developers are familiar with. Using this technique, you break the entire project into the individual components that are going to be impacted. Within each component, you itemize the changes that have be be made. You then estimate how long each of those changes will take to complete. Add up the changes for a component and you have the estimate for the component. Add up the components within the project, and you have the construction estimate for the entire project. There are a couple of issues with this technique. The first problem is that it requires a detailed level of design knowledge concerning the project to come up with an estimate. If you are in the early stages of a project, you aren’t going to know all of the components that must be modified. And if you don’t even know the components you certainly aren’t going to know the changes within the components. The second issue is that you have to know the skill level of the person doing the work. If you have a rock star developer doing the coding, then the estimate should be significantly different then if you have a new hire. In order to put together this kind of estimate you need to know who is doing the work. But, this level of estimate does have its place. It just needs to be utilized late in the project, after technical design has been completed and you know who is going to be doing the development. Story Point Estimation is the most popular form of estimation on projects using Agile methodologies. Using this technique, you begin with all of the User Stories, or Use Cases, for the project. Then a number is assigned to each of those stories to indicate their relative size. Normally, this number is from the Fibonacci sequence (1, 2, 3, 5, 8, 13, etc.) or a power of 2 (2, 4, 6, 8, 16, etc.). When the numbers are first assigned, they are not given a unit of measure. That is, a User Story that is assigned a “2” does not necessarily take 2 hours or 2 days to complete. The numbers are assigned based on the estimated size relationship between the User Stories. That is, if User Story 1 is assigned a “2”, and the team decides that User Story 2 is around 50% larger that User Story 1, User Story 2 will be assigned a “3”. Once all of the User Stories have been assigned a number, the team will decide what they thing their starting velocity will be. They may decide that they can complete work on 20 Story Points per 2 week iteration. The User Stories to be completed during the first iteration will be determined based on this Velocity. Project Management can also use this velocity to project when the entire project will be completed. After each iteration, the actual velocity will be computed to determine if the number of Story Points per iteration needs to be adjusted up or down. Based on this adjusted velocity, management can determine if they need to push out the end date of the project or remove User Stories from the scope. Story Points is a great estimation technique to use in Agile development where you aren’t expect an precise estimate. It gives you a tool to measure how the work is progressing and to project when the work will be complete. Function Point Analysis is one of the estimation techniques I have been most excited about over the past few years. It’s actually a specific implementation of the “Count” methodology that I talked about prevoiusly. But, I figured it was important enough to give it it’s own post. In Function Point Analysis you count the number of Function Points in a project. To get there, you first have draw a boundary representing the scope of your project. You then make an inventory of all of the interfaces (data in motion) and files (data at rest) associated with the project. Internal Logical File (ILF): A file whose data is created and maintained by this application. External Interface File (EIF): A file whose data is referenced by this application, but not maintained by it. For each one of the file types you have to count the number of record element types (tables) and data element types (columns within the tables). Based on these counts, each file is assigned a number of Function Points. The important thing with these files is to keep in mind that they might not actually be a database or a file. They could be something like another system that is interfaced with. External Inputs (EI): Data coming into the system from outside the system. An example would be a user’s login form. External Outputs (EO): Data coming out of the system from inside the system. An example would be a report. External Inquiries (EQ): An interface where some data comes in which causing processing and then some data coming out. An example would be a search form. For each of these interfaces, you have to identify the number of record file types that are interfaced with and data element types that are carried along the interface. Based on those counts, each interface is assigned a number of Function Points. Once you have identified the interfaces and files and assigned a number of Function Points to each, you can add up those counts and come up with your Unadjusted Function Point count. The Global System Characteristics can then be used to adjust this Function Point Count. The Global System Characteristics are attributes used to assess the complexity of an application. Once you assign a rating to each characteristic, you come up with an adjustment factor. It may be something like 1.1. You then muliply your Unadjusted Function Point Count by this adjustment factor to get your Adjusted Function Point Count. At this point you just have a number which is pretty meaningless on its own. However, industry standards exist showing, on average, how long it takes application development teams to complete projects of different Function Point counts. In my experience doing .Net projects, I know that it takes about 15 hours per Function Point for coding and unit testing. This will give you the hours for development. The percentages assigned to each phase of the project can then be used to determine how long the entire project will take. It’s very easy to learn the basics of counting Function Points. Becoming an expert, however, takes lots of study and practice. If you give the same project requirements to two different expert counters, their counts will come out almost identical. This makes Function Point Analysis a very useful methodology for estimating the size of a project. Today’s I’d like to dive into another software estimation methodology. I’ll refer to this only simply as Counting. Using this technique you find something to count and base your estimation upon that count. It must be available early on in the project (preferably at the Requirements stage, not the Technical Design one). It should be highly correlated to the actual effort invovled to execute the project. You should have historical data available telling you how long it will take for you to construct it. To come up with your estimat, you simply have to inventory the web pages you are going to create as part of this project, and assign them to those categories. Using these counts, you can come up with the total amount of time for coding and unit testing. Based on your project breakdown percentages you can then derive the time for the other phases and get your complete estimate for the project. This technique can be further refined by breaking your components into those that are being Created or just Modified and getting afterage times for Simple, Average, and Complex components in those two categories. An additional factor can be added to this estimate to take into account the skill level of the developer doing the construction. Say, for instance, you estimate what it would take for an Average developer to do the coding. From your historical data it my be clear that it takes a Novice 50% longer to do the construction and an Expert only 3/4 the time. So, you could break your components down by the skill level of the person doing the development, muliply the Novice ones by 1.5 and the Expert by 0.75. So far I have been describing this estimation technique in a way that relies heavily on having your own historical data available. But, what if you do not have this information? In that case I would recommend using an industry standard metric to count that has associated industry historical data avaiable. Function Point Analysis is a perfect example of a very refined Counting technique. I will explore this in detail in a later post.